One of the most visible and well-known Isle of Wight habitats, the downs shelter many vulnerable species and are also cherished landscapes for visitors and locals alike. The most distinctive ecological characteristic of the Isle of Wight's downs is the community of plants and animals which have grown up on the chalk grasses found there. Although other types of habitat are often found on the downs, for example farmland or woodland, it is the chalk grassland which is the most visually important in the landscape, ands which includes some of the most specialised and rare habitat and species. 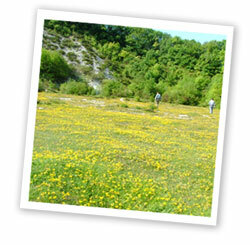 Chalk (calcareous) grassland is one of the richest and most distinctive wildlife habitats in this country. The calcareous grasslands of the Island range from those of European importance for their plants, through those of national significance, to those of importance for the local biodiversity of the Island. 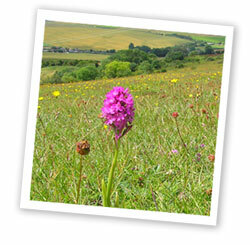 Many species of plants and invertebrates are restricted to this habitat and are sensitive to grazing management. Much of the chalk grassland, particularly in West Wight, is similar to that of Purbeck in Dorset, to the west. A particular feature is the influence of the coast which has given rise to extensive maritime chalk cliffs and cliff top grassland supporting populations of several nationally rare and scarce plants and invertebrates. A strong maritime influence on the south facing slopes at the western end of the Island has resulted in a distinctive grassland community. There are also important fragments of rich lichen communities. Scrub can be a prominent feature on some sites, and species-rich scrub / grassland mosaics can result in increased plant and animal diversity, particularly benefiting invertebrates, but this requires careful balanced management to retain the interest. The downs in the west Wight are often capped with clay with flint deposits supporting gorse scrub, and in a few places, a chalk heath community.